Lourdes Candles depicting the Apparitions and vigil candles for 9, 6 and 3 days and night. Apparition Votive Candle & Prayer Card with Medal. Boxed I lit A candle Card with Candle. Saint Threresa Votive Candle & Prayer Card with Medal. Saint Pio Votive Candle & Prayer Card with Medal. Saint Anthony of Padua Votive Candle & Prayer Card & Medal. Easter Candle with Purple Ribbon, 6" / 15 cm Tall. 4 x Sacred Heart of Jesus Votive Candle's with Prayer. Saint Peregrine Votive Candle's with Prayer. 4 x Divine Mercy Votive Candle's with Prayer. 4 x Holy Family Votive Candle's with Prayer. Holy Communion Chalice Pillar Candle. 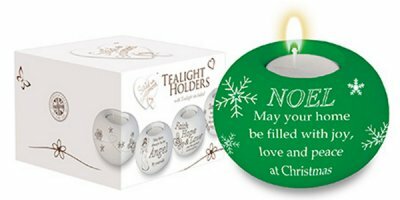 Green Nativity Candle Holder & Tea Light. Red Nativity Christmas Candle with Ribbon 2016. 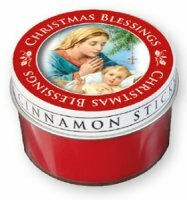 Glass Jar Scented Nativity Candle - Cinnamon Scented. 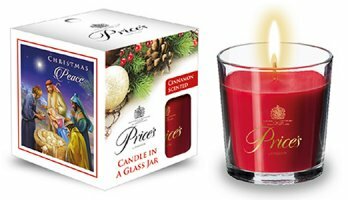 Glass Jar Peace Candle - Cinnamon Scented. 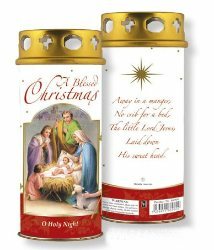 Christmas Cinnamon Scented Nativity Candle - Holy Family. 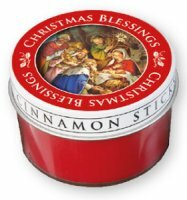 Red Christmas Blessings Candle with a Prayer. 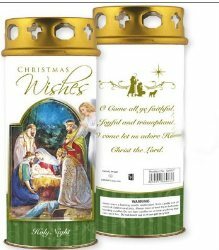 Green Christmas Blessings Candle with a Prayer.